This is the paperback edition of The Perfect Murder, a "literary experiment" in which Tony Hillerman participated. 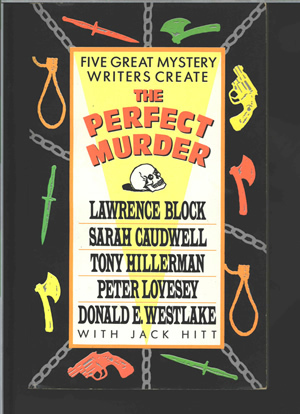 The book's editor, Jack Hitt, asked five well-known mystery authors to contribute advice for a hypothetical "perfect murder" scenario. The book also contains contributions by Lawrence Block, Sarah Caudwell, Peter Lovesey, and Donald E. Westlake, in addition to Tony Hillerman. The front cover of this edition displays the book title, contributor names, and editor name. The back cover is formatted similarly, describing the idea of the book, and quotes The Los Angeles Times Book Review calling it "A nifty caper." Binding: Spot-color paper covers. Along the spine, the publisher's imprint, book title, small skull drawing, editor's name, book ISBN and price are printed.